The phase of the migration you are hunting plays a huge role in what you can expect on a hunt. In the information below I will break down the migration into three different phases, how you can figure out what phase you are in, timing the phase you want to hunt, and some tips for each phase to maximize your success. The migration back north through any given area is usually 2-4 weeks long. On years with unusual weather (extreme cold or heat, no snow, late blizzards etc.) this can be off, but 2-4 weeks is a good bet. The Front Push…Smart Old Birds! The beginning of the migration is filled with a high percentage of mature geese. They travel in very large flocks; will push north as quickly as possible. The snowline is the main stopping point for these birds. Often times you will find them sitting on the ice while roosting. 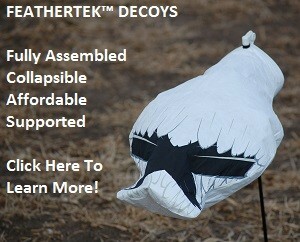 Hunting these birds can be very frustrating as they have seen multiple decoy spreads in their life. To be successful you need to have all your ducks in a row. If at all possible stay out of fields with lots of snow cover in them. I prefer corn over beans, but will hunt either if it has standing water in it over a dry field. Just don’t make the mistake of hunting a sloppy field or sheet water spread and leaving your decoys out overnight if it going to freeze. They will all be frozen in come morning and you will not be happy! The best time to snow goose hunt is whenever you can during the migration, but if you have a limited amount of days you can hunt, this is not when I would schedule those limited days in the field. And one last piece of advice on the first push of birds….keep the internet postings you read in check. Lots of new snow goose hunters get excited when the first birds start showing up and predicting they are all going to blow through in a week. Most likely they will not, and holding off on your hunt a few days or a week will benefit your hunt…trust me on that one! The Main Migration…My Favorite Phase To Hunt! When I think back on my favorite hunts (it’s who I was hunting with the made the most impact) almost all took place during the main migration. You will see feeding geese at the crack of dawn, migrating geese during the day, and feeding geese at night. During this phase hunting a large permanent set in a high traffic migration areas is often as good as chasing the hot feeds . It is also much less labor intensive to hunt a permanent set than to move each morning. Often times the best shooting can come during the middle of the day, especially when hunting on or near water. This is also the time to get away from other hunters and there decoy spreads. I don’t want to be the 3rd or 4th decoy spread the geese flew over that day. The end of the migration is most often filled with young of the year geese often referred to as “juvies”. These birds decoy well and can make for some exciting hunts…if you can find them. They are spread out and once they find an area they like, they typically do the same thing for multiple days in a row. This makes patterning them easy once you find the roost and preferred feed field. • Hunting the exact field they are feeding the night before is critical. If this is not possible get in front of them a field or two. • Portability is critical to your success. This is not the time to be hunting the same filed day in day out. • Put the e-caller close to you. They will key in on the sound. • They are suckers for rotary machines and any kind of motion! • Once you find an area holding juvies at the end of the migration, keep this to yourself as it will tend to produce year after year. • Having an extension on your gun can really pile up the birds. These young of the year geese will often be back peddling into your spread making your 5 plus shots all within range. By using the hunting tips above in your trip planning and hunt planning I know you will bag more birds.